As the name suggests, these tiles are ideal for areas that are exposed to water, like bathrooms, en suite bathrooms and wet rooms. 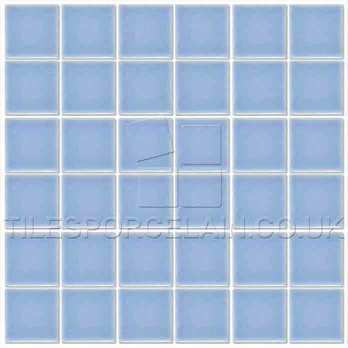 Ceramic Pool Sky Blue Mosaics can be deployed as a splash back feature above worktops or as a general wall tile. They even look stunning as a border tile in kitchens and hallways. The stylish sky blue colour is enhanced further by a highly polished finish. With a subtle colour these tiles will combine with both light and dark shades for contemporary designs. The sleek and smooth surface will not only reflect light to produce a majestic shimmer and glow but also allows for easy cleaning and maintenance.